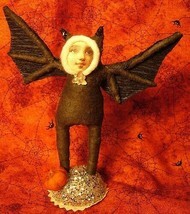 Spun cotton and Crepe paper wings. She measures 5 inches and is in perfect condition. Vintage by Crystal are Crystal and Ben Sloan handmade Vintage Inspired Figures and Ornaments for the Holidays and Special Occasions and Everyday Enjoyment using Old German Artisan Technique called Spun Cotton. This Style is Reminiscent of the rare antique Christmas ornaments that were handmade in 19 st Century Germany, but with a modern and unique personal twist. They start by making wire armature and then spin loose natural cotton by hand around the wire to crate a soft sculpture of a person, animal etc.